A celebration of America’s original musical art form, Jazz Maui 2013 featured instructional workshops for students and performances by visiting and local professional jazz musicians. Jazz Maui 2013 was produced by Arts Education for Children Group (AECG), a 501(c) nonprofit organization established in 1986 to provide opportunities for artistic and cultural enrichment (www.aecg.org). 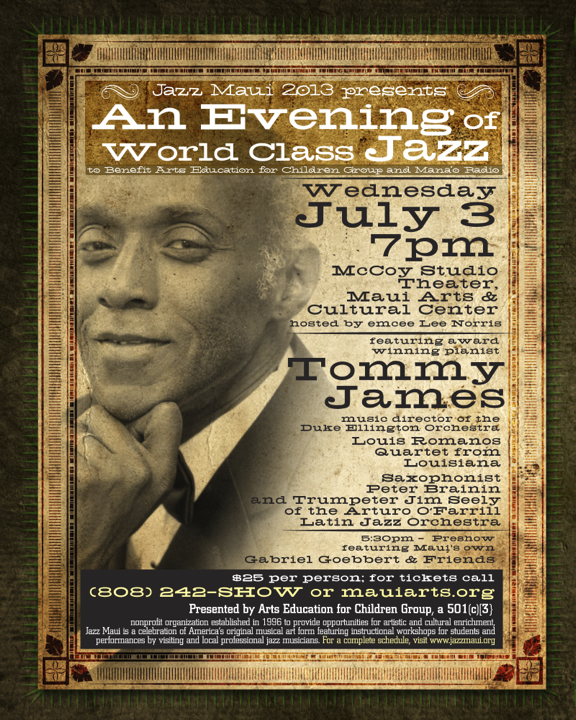 Establish an annual signature event featuring high quality jazz and various music performances for the enjoyment and enrichment of visitors and local residents further distinguishing Maui as a culturally-rich world-class destination. 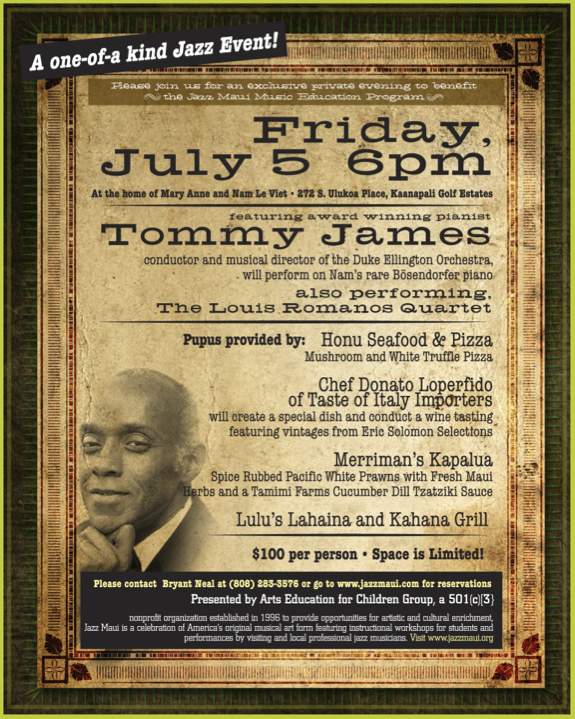 Tommy James – piano • Peter Brainin – saxophone • Jim Seeley – trumpet • Louis Ramanos Quartet • Dan Sumner – guitar • Danny M. – bass • Alex Noppe – trumpet • Maui Community Band • Local musicans – Gene Argel, Mike Buono, and others. 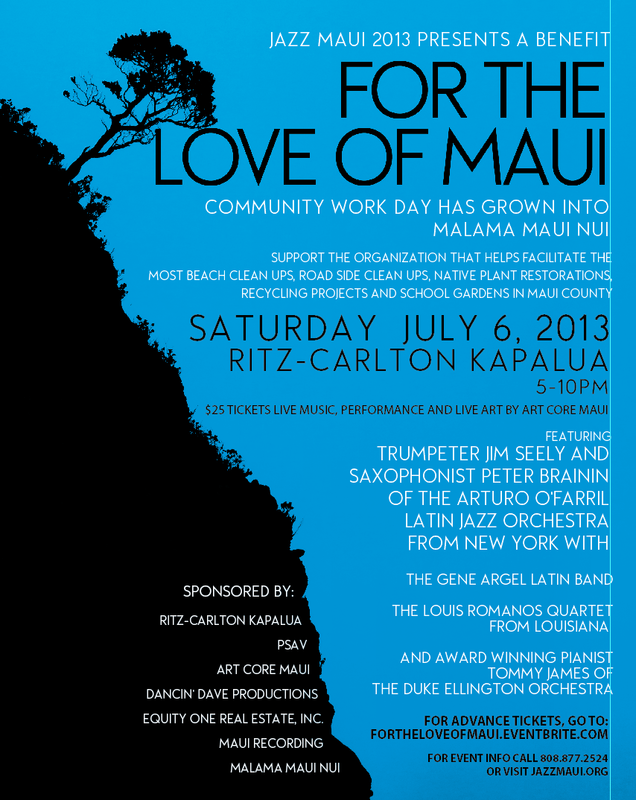 July 6: For the love of Maui, a Benefit for Community Work Day Concert at the Ritz-Carlton, featuring an All-star lineup of local and visiting music professionals including Gene Argel Latin Band, Louis Romanos Quartet, Tommy James, Jim Seeley, Peter Brainin. and a special guest performer.